World War II is drawing to a close in East Prussia and thousands of refugees are on a desperate trek toward freedom, many with something to hide. Among them are Joana, Emilia, and Florian, whose paths converge en route to the ship that promises salvation, the Wilhelm Gustloff. Forced by circumstance to unite, the three find their strength, courage, and trust in each other tested with each step closer to safety. Just when it seems freedom is within their grasp, tragedy strikes. Not country, nor culture, nor status matter as all ten thousand people—adults and children alike—aboard must fight for the same thing: survival. Told in alternating points of view and perfect for fans of Anthony Doerr's Pulitzer Prize-winning All the Light We Cannot See, Erik Larson's Dead Wake, and Elizabeth Wein's Printz Honor Book Code Name Verity, this masterful work of historical fiction is inspired by the real-life tragedy that was the sinking of the Wilhelm Gustloff—the greatest maritime disaster in history. As she did in Between Shades of Gray, Ruta Sepetys unearths a shockingly little-known casualty of a gruesome war, and proves that humanity and love can prevail, even in the darkest of hours. Ruta Sepetys (www.rutasepetys.com) is an internationally acclaimed author of historical fiction published in over fifty countries and thirty-six languages. Sepetys is considered a "crossover" novelist as her books are read by both teens and adults worldwide. Her novels Between Shades of Gray, Out of the Easy, and Salt to the Sea are all New York Times bestsellers, international bestsellers, and Carnegie Medal nominees. Her books have won or been shortlisted for over forty book prizes, are included on over twenty state reading lists, and are currently in development for film. Born and raised in Michigan, Ruta now lives with her family in Nashville, Tennessee. 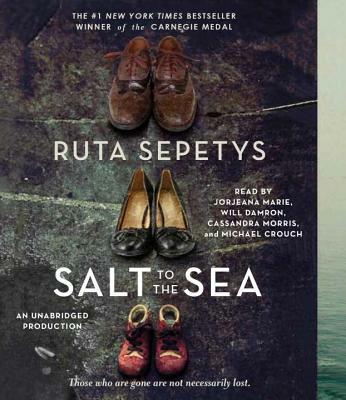 Follow her on Twitter @RutaSepetys.